Issue over big poll candidate resolved on time! A certain public statement made by the Pohottuwa Secretary caused a pandemonium in the Blue Camp. He had told the media that their candidate for the race for the big poll round the corner would be none, but someone from the Pohottuwa itself. The former strongman, now Number Two had gone into a rage when he heard about this statement. He had immediately given the Secretary an earful for talking out of turn at a very sensitive moment in their political manoeuvrings. Meanwhile, those close to Number One too had panicked. And they had lost no time bringing this into the notice of Number One. As tensions were rising in the Blue Camp, the Political sibling aka Pohottuwa theoretician had lost no time in calling on Number One to explain that their Secretary had made the damaging statement without consulting the party leadership. 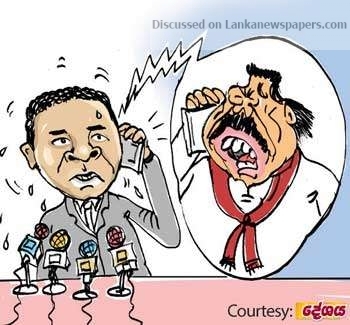 As soon as this round of talks was over, the Blue Party secretary issued a media communique clarifying that the candidate of the new UPFA- SLPP alliance would enter the fray at the upcoming big poll on the Betel Leaf ticket. ← Wilpattu deer interrupted his night dreams!